This delicious soup was inspired by the potato-kale soup in Terry Hope Romero's Viva Vegan! Romero provides a recipe for homemade vegan chorizo in her fantastic cookbook, but I just used the store-bought stuff. If you don't want to buy or make vegan chorizo, you could eat this soup without it, but seriously ... it's the chorizo that really knocks it out of the park. and bring to a boil over high heat, covered. 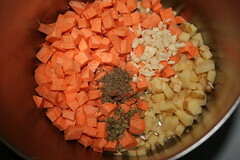 Once boiling, reduce the heat to low and simmer for about 30 minutes, until the yams and potatoes are very soft. Once pureed, return to the soup pot. If desired, you can mash the remaining yams and potatoes with a potato masher or other mashing implement. and increase the heat to medium. Stir until the kale is wilted. NB: This should have only taken maybe 5 minutes, but because I used prepackaged kale from Trader Joe's, I had to cook this for about 15 minutes. Why? Because the TJ's kale didn't have the thick stems removed, so it had to be cooked for a lot longer! In the end this wasn't a problem, so if you don't want to remove the stems I guess you don't have to -- just be prepared to cook it longer, until the stems are nice and soft. and stir seasonings into the soup. Turn off heat and let the soup rest while you lightly saute the chorizo. There really aren't instructions for the chorizo -- I just sauteed some store-bought vegan chorizo in some olive oil for a few minutes, being careful not to burn it. How much chorizo you garnish your soup with depends on your tolerance for heat and your own personal tastes. I probably used about a Tablespoon of chorizo per cup of soup. 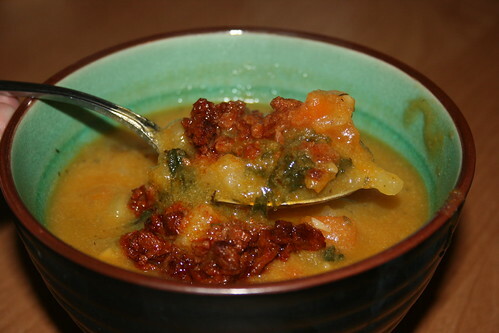 Ladle soup into a bowl, garnish with desired amount of chorizo, stir chorizo into the soup, enjoy! Verdict: This is one of my new favorite soups. I love the combination of yams, potatoes, and chorizo, and love finding ways to sneak kale into my food (not to mention okara). Oh my gosh, this looks incredible! Can't wait to try it out!